Direct endoscopic necrosectomy (DEN) is a minimally invasive treatment option that has been introduced in recent years for the treatment of infected walled-off pancreatic necrosis (WON), and has been performed as an alternative to operative and percutaneous therapy   . An esophageal, fully covered, self-expandable, metal stent (FCSEMS) has a large diameter and can provide effective drainage for pancreatic collections. Both ends are flared, allowing apposition, preventing migration, and facilitating endoscope passage and debridement in the retroflexed position. Herein, we demonstrate technically and clinically successful treatment of WON by DEN using an FCSEMS in a patient who was not a candidate for a transgastric approach. This treatment could be a good therapeutic option for infected WON lesions located some distance from the gastric wall. 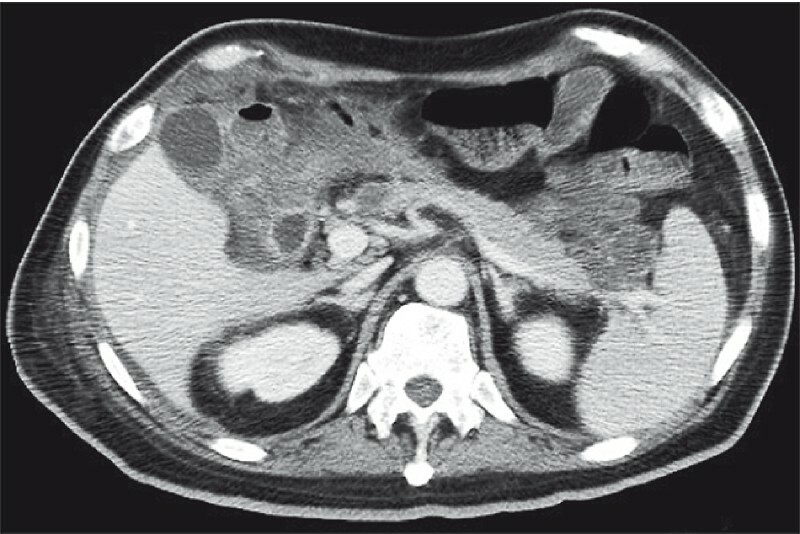 A 48-year-old man presented with infected pancreatic and peripancreatic necrosis 4 weeks after the onset of severe necrotizing pancreatitis. 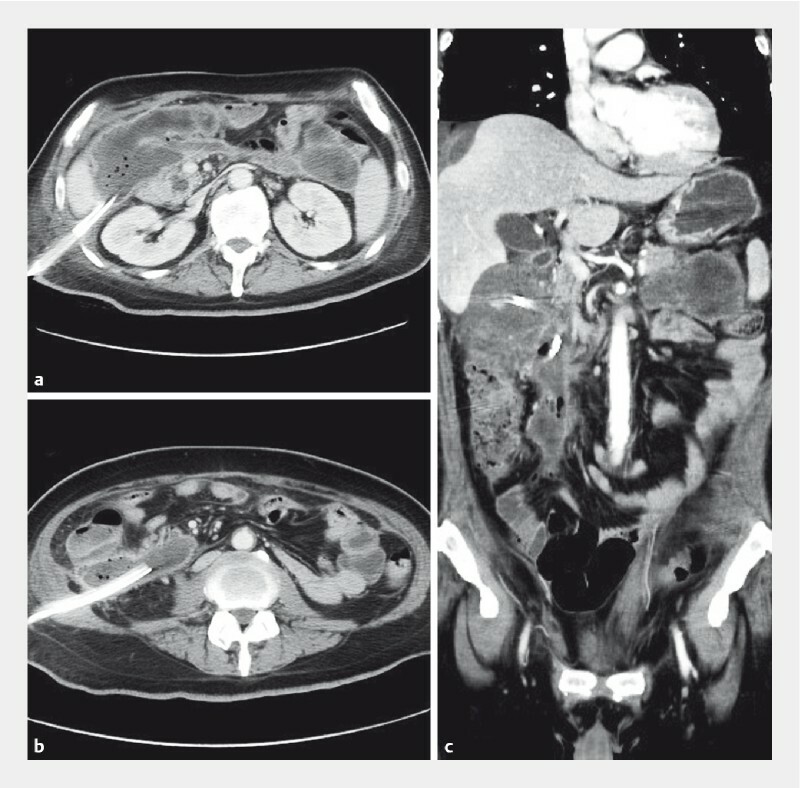 Computed tomography (CT) scan revealed a large well demarcated WON involving the subhepatic space, which extended downward to the right colonic mesenteric space and included a 30-mm partially solid necrosis at the pancreatic tail. 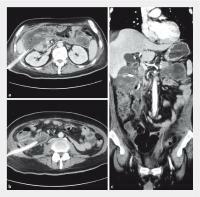 Although the patient was treated with intravenous antibiotics and percutaneous drainage of the subhepatic and right infrarenal space, only the liquid drained away and the solid necrotic matter remained ([Fig. 1]). Therefore, the patient was referred to our hospital for treatment of the infected pancreatic necrosis. Fig. 1 Contrast-enhanced abdominal computed tomography before treatment. a Previous subhepatic percutaneous drainage tube. b Previous percutaneous drainage tube in the right infrarenal space. c Coronal plane. First, the necrotic cavity was accessed by advancing a 0.025-inch guidewire through the previous infrarenal percutaneous drainage tube under fluoroscopic guidance. The FCSEMS (Hanarostent, diameter 22 mm, length 90 mm; M.I. Tech, Seoul, Korea) ([Fig. 2]) was passed over the guidewire and into the intra-abdominal cavity under fluoroscopic guidance, which also confirmed cavity access. The stent was successfully deployed in the necrotic cavity by simple retraction of the catheter sheath. Fig. 2 An esophageal, fully covered, self-expandable, metal stent (Hanarostent, diameter 22 mm, length 90 mm; M.I. Tech., Seoul, Korea). In the second step, we performed DEN using a forward-viewing therapeutic gastroscope via the FCSEMS route. The snare catheter was introduced to perform repeated mechanical debridement. To avoid bleeding and injury to the intact tissue, we slowly grasped the superficial layers and pulled without significant resistance. The necrotic tissue culture showed Corynebacterium striatum infection. The procedure was repeated every 2 – 3 days until the necrotic material was completely removed and a clean cavity, lined with granulation tissue, was achieved. Between the necrosectomy sessions, the FCSEMS remained in place and was finally removed at the end of last debridement session. The patient required a total of four endoscopic debridement sessions in order to almost completely remove the necrotic debris. He subsequently made a rapid recovery. Follow-up CT documented a dramatic decrease in the size of the WON and a small lesion at the pancreatic tail, which could be resolved by medication alone ([Fig. 3], [Video 1]). Fig. 3 Follow-up contrast-enhanced abdominal computed tomography after four sessions of direct endoscopic necrosectomy. Video 1 Percutaneous endoscopic necrosectomy using a fully covered, self-expandable, metal stent in severe necrotizing pancreatitis.